Announcement: Model Company for Utilities v3.0 Released! Deregulation is creating a new breed of competitors in several countries, capable to face the same challenges of traditional Utilities supply Companies. In this era of digital growth, the role of SAP is to offer a digital business framework of pre-packaged, ready-to-use, end-to-end reference solutions that are customised to meet the needs of utilities providers. 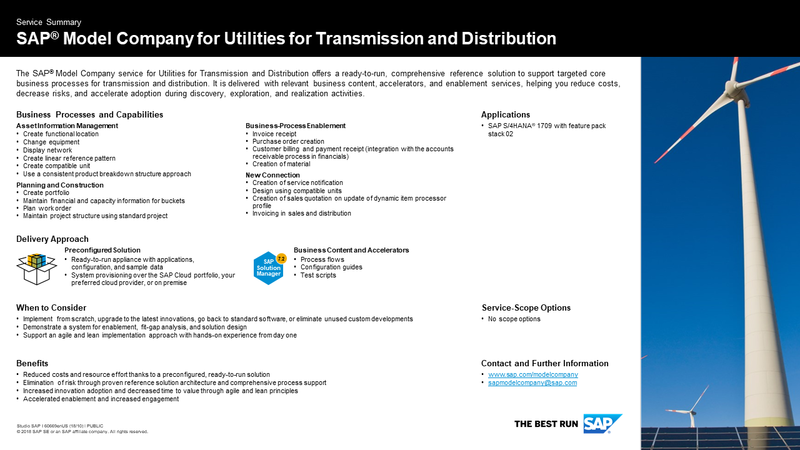 The SAP Model Company services for Utilities help customers simplify, accelerate, and enable digital transformation by providing a framework based on the broad business process expertise SAP has acquired as a result of decades of project experience. 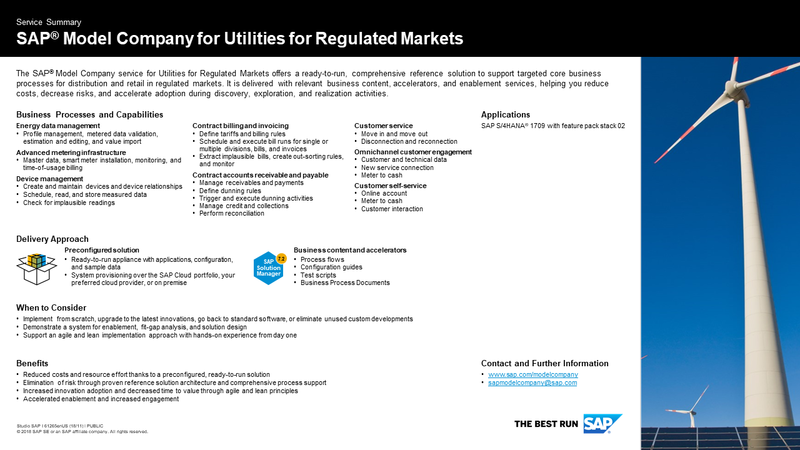 SAP Model Company for Utilities offers a ready-to-run, comprehensive reference solution for support of targeted core business processes in the utilities industry. It is delivered with relevant business content, accelerators and enablement services, helping Customers to reduce costs, decrease risks, and accelerate adoption during discovery, exploration, and realization activities. Since its inception 2 years ago, the Model Company for Utilities has grown in maturity and customer base. And as it was intended, it has become a true accelerator for larger deals to those customers that appreciate its capability to speed up S4/HANA adoption and bring down cost. That’s why we are proud to announce that now version 3.0 has been released, bringing more content and solutions and a better user experience. All available scope options are now part of the SAP Product and Services portfolio and can be consulted directly on our SAP Cloud Appliance Library. Transmission & Distribution: A Water Data Model, Fiori Apps for better user experience and functionalities for extended Risk Analysis and Scoring Models of project proposals. From the perspective of easy financial planning, MS Excel based workbooks functionality within CPM (Commercial Project Management) has been made available.